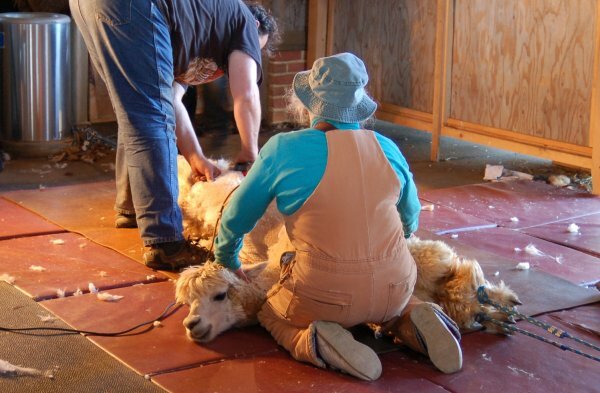 Enjoy photos from this past years Second Annual Island Alpaca Shearing Day, Saturday April 25, 2009! 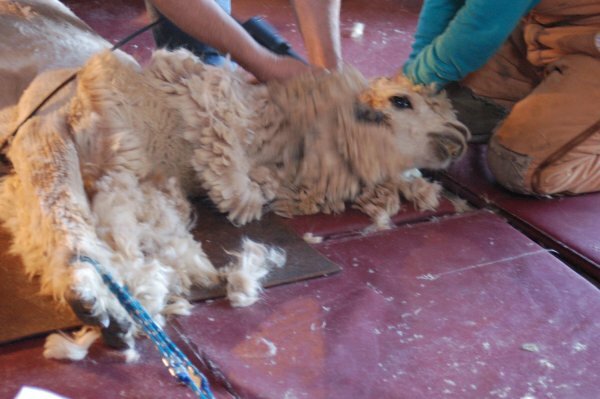 Here is a video from our 2011 Shearing day! 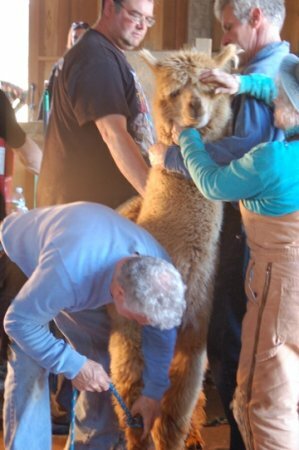 2009: Island Alpaca Second Annual Island Alpaca Shearing Day Open House was once again a HUGE success! 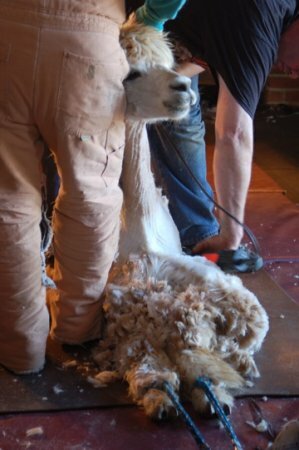 On this beautifully warm, sunny day we sheared over 40 alpaca. 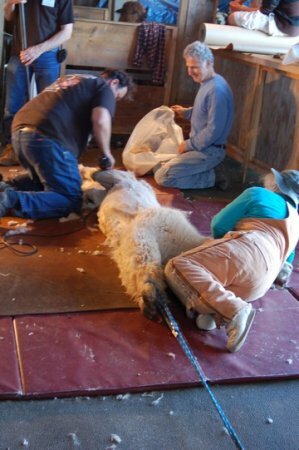 They were thrilled with the work of our expert team, and are now cool and comfortable creatures pronking in our pastures! Thank you to all of the people that attended and made it such a fun event! 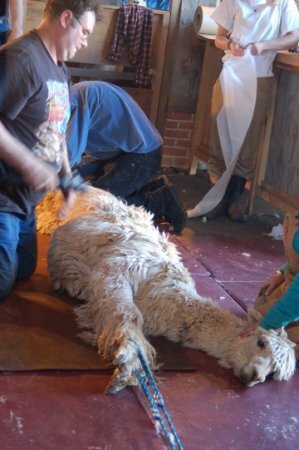 We are especially happy to announce the WINNERS of our Shearing Day Raffle; Marsha Gressler, of Oak Bluffs, won our new book for children: "Blue-Ribbon Alpaca", Matthew Barton, (11 y/o), of Vineyard Haven, won our Alpaca Fur Bear, and Kendra Bakerink, of New Bedford, won a $50 Island Alpaca gift certificate. Congratulations to all!! 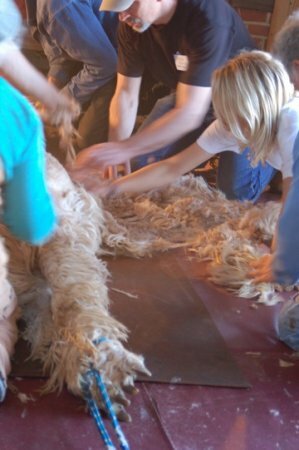 A very special thanks to our shearers, Matt and Jozi Best, our many volunteers, friends, and staff members for their assistance; Kathleen Byrnes, Toni Chute, Anna Marie D'Addarie, Sandy D'Amico, Barbara Dutton, Luke Eldridge Bartkus, Philippe, Annabelle Grob, Johanna Leazott, Caila and Mael Morin, Charles and Luise Ronchetti, Ralph Stewart, Douglas Touart, Phoenix Russell, Pricilla Sinatra, Pat Waring, Heather Welch, and Erica Wilkinson. We are forever grateful, and could not have done it without you! 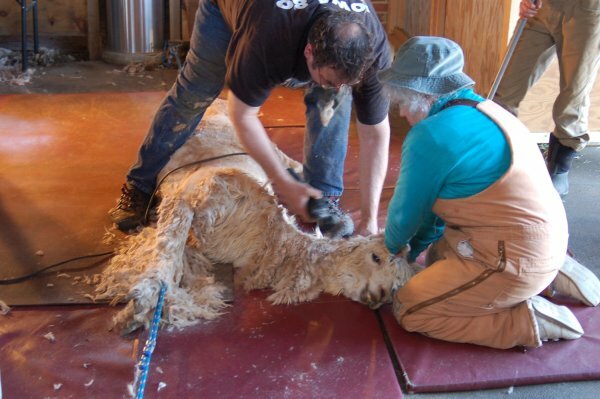 Shearing Fun Facts: Alpacas are shorn just once a year in the Spring. 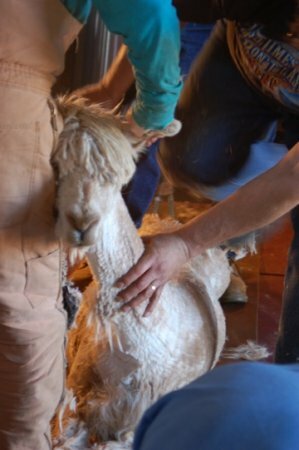 Each alpaca produces between 3 and 13 pounds of fiber depending on age, genetics, environment and nutrition. 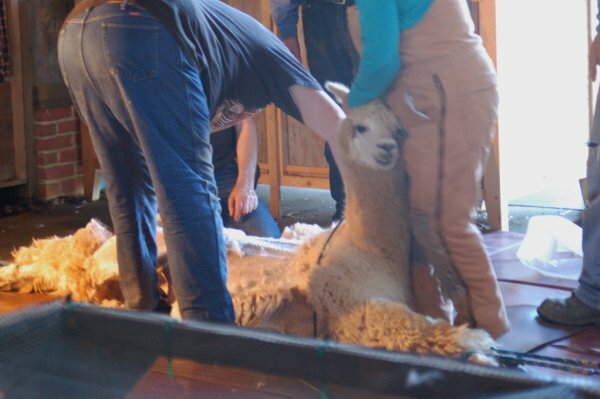 Alpacas can be shorn standing up or stretched out on the ground or a table. 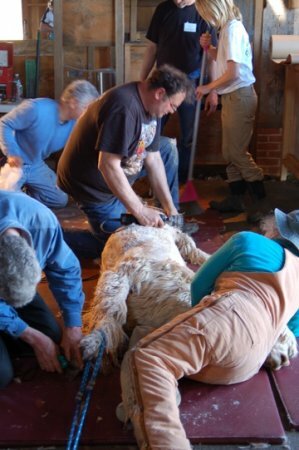 We prefer to stretch them out, tying the front legs together and the back legs together. 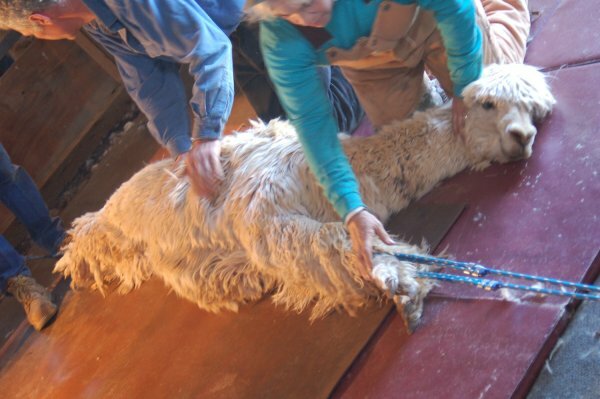 This method allows the shearer to work faster and get a more even cut, it is less stressful for the alpaca this way. 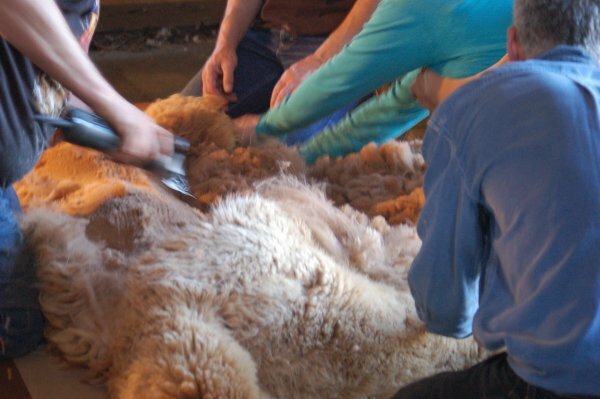 Shearing time varies greatly by the expertise of the shearer, but generally 10 minutes per animal is standard. 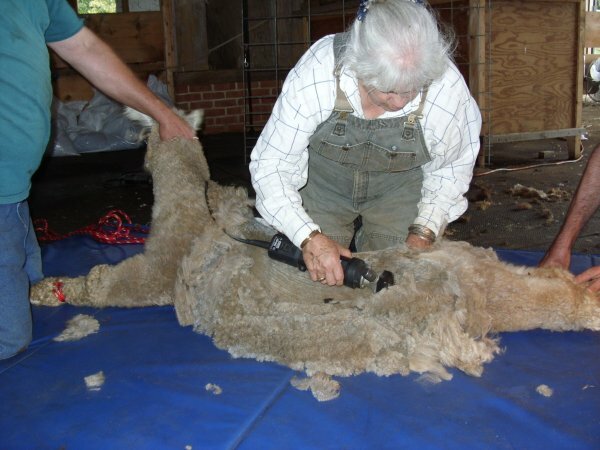 Alpacas are shorn with the same clippers that are used for sheep. Blades have to be sharpened and oiled often. 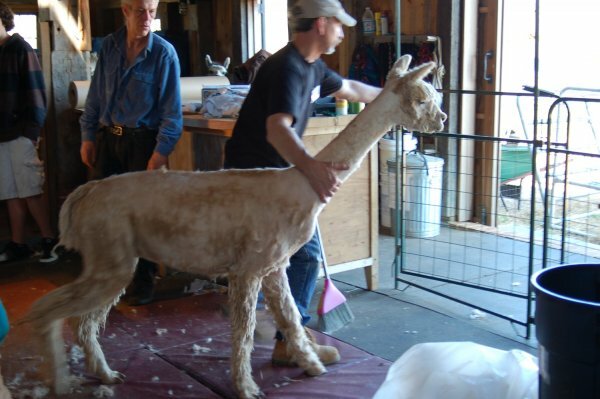 Because alpacas don't have natural lanolin oils like sheep, the clippers need to be oiled more frequently. 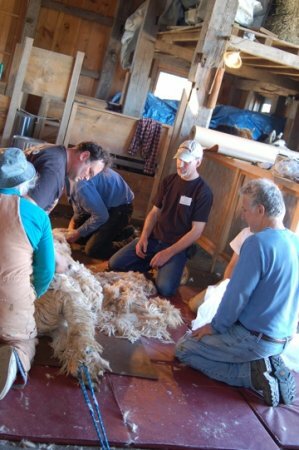 Do mark your calendars for our Fourth Annual Shearing Day, April 23, 2011, 9 am - 3 pm. 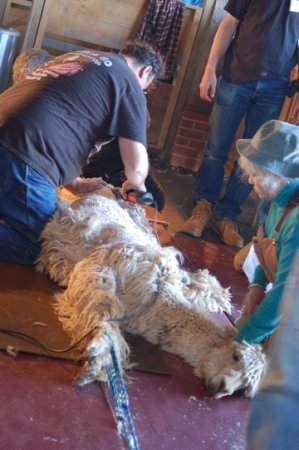 Refreshments served, and chilli available for purchase for you to enjoy while watching our newly sheared alpaca showing off their new haircuts. Our viewing area comes complete with picnic tables for you to sit and relax! Visit our farm store to see the end result of this great process. Find beautiful roving, yarns, and locally produced garments from these wonderful animals that graze in our pastures! Hope to see you at the farm! Please sign our guest book to receive an email reminder about the event! -- Need a place to stay, or to house your extra guests? Visit our accommodation pages. 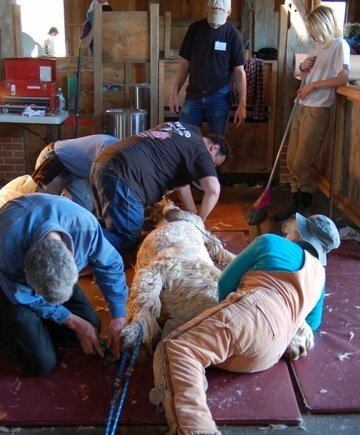 A very special thanks to our "official" shearing day photographer, Ralph Stewart.